Mouse monoclonal CD59 antibody [MEM-43]. Validated in WB, IP, IHC, Flow Cyt, ICC/IF and tested in Human. Cited in 15 publication(s). Independently reviewed in 2 review(s). CD59 antigen (human). MEM-43 identified CD59 as the new cluster on 4th HLDA Workshop. MEM-43 reacts with well defined epitope (WhO, P-53). ICC/IF: Human fibrosarcoma cells. Flow Cyt: HT1080 cells. When originally tested in WB, SDS was included in the sample buffer, however, feedback from one researcher has shown that it is best to omit SDS from the sample buffer. Purified by protein A chromatography. Our Abpromise guarantee covers the use of ab9182 in the following tested applications. WB Use at an assay dependent concentration. Use under non-reducing conditions. Defects in CD59 are the cause of CD59 deficiency (CD59D) [MIM:612300]. N- and O-glycosylated. The N-glycosylation mainly consists of a family of biantennary complex-type structures with and without lactosamine extensions and outer arm fucose residues. Also significant amounts of triantennary complexes (22%). Variable sialylation also present in the Asn-43 oligosaccharide. The predominant O-glycans are mono-sialylated forms of the disaccharide, Gal-beta-1,3GalNAc, and their sites of attachment are probably on Thr-76 and Thr-77. The GPI-anchor of soluble urinary CD59 has no inositol-associated phospholipid, but is composed of seven different GPI-anchor variants of one or more monosaccharide units. Major variants contain sialic acid, mannose and glucosamine Sialic acid linked to an N-acetylhexosamine-galactose arm is present in two variants. Cell membrane. Secreted. Soluble form found in a number of tissues. 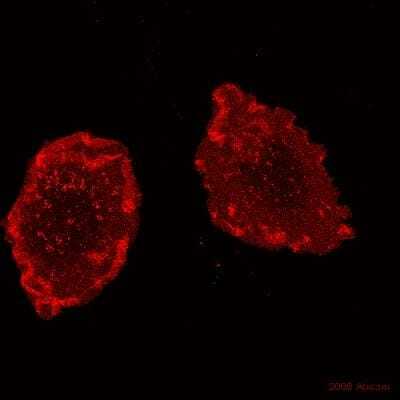 Immunocytochemistry/ Immunofluorescence - Anti-CD59 antibody [MEM-43] (ab9182)This image is courtesy of an anonymous Abreview. Human fibrosarcoma cells stained for CD59 (red) using ab9182 at 10 µg/ml in ICC/IF, followed by Donkey anti-Mouse Alexa 555 at 1/500 dilution. ab9182 staining CD59 in Human fibrosarcoma (HT1080) by Flow Cytometry. Cells were fixed with paraformaldehyde. The sample was incubated with the primary antibody,10 µg/ml in PBS, for 1 hour at 20°C. An Abcam PE-conjugated donkey polyclonal to mouse IgG ( ab7003), 5 µg/ml, was used as secondary antibody. Publishing research using ab9182? Please let us know so that we can cite the reference in this datasheet. I purchased ab9182 which is CD59. I have try dilutions from 1/10 to 1/100 and nothing seems to work. I don't get any staining. Today I tried with placenta, 1/20, antigen retrieval with Tris for 32 min and again nothing. I'm using Benchmark automated stainer. Any suggestions??? The lot # is GR36289-3 and order #1021675. Let me know if you need any other information. Thank you for contacting us. I am sorry to hear that you are having trouble using this antibody. - Could you explain the antigen retrieval method bit more? The information I am after is Buffer, buffer ph; hot plate boiling method, microwave boiling method or pressure cooker method. - Are you suing human placenta sections? - Which statement you would choose e.g. high background, no staining or light staining. - What was the secondary antibody e.g species, type, isotype, dilution etc? - Have you used same secondary antibody before? Is it true the anomaly is not due to secondary antibody? - Does the detection system works fine? Have you tried using it with other antibodies and tissue sections? - Could you send us an image? - How the antibody was stored since ordering? - Have you preformed any other troubleshooting than changing dilutions? In order to help you further with this antibody I will look forward to hearing from you . This is in regards to our Mouse monoclonal [MEM-43] to CD59, which the datasheet says is valid for Functional Elisa, but says it contains Azide, which is confusing to the customer. We have removed functional studies from the datasheet for ab9182 since the sodium azide present in the storage buffer is toxic to cells. Inquiry: The customer is looking for the secondary anti mouse to stain the cells (ICC/IF) with ab9182. Kindly advise if anti mouse IgG (like ab98794, for instance) can be used or it should be specific anti IgG2a (ab97244). Thank you. 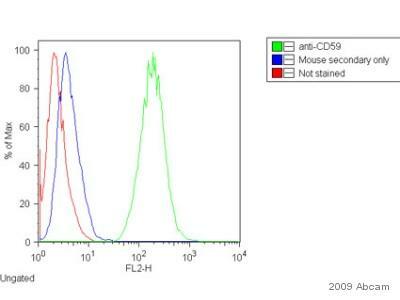 For ab9182 the ab97244 is indeed a compatible secondary antibody that can be used for ICC/IF. The ab98794 is an IgG antibody which can cross react with IgG2a however because we do not have tested data so we can't 100% guarantee this. Our recommendation is to use the compatible secondary antibody. According to our records, ab9182 was proving difficult to use inIHC and we were in contact in order to help resolve the issue. No signal in IHC-P on intestine or placental tissue. I am sorry that you were having problems with ab9182 in IHC-P. As we discussed, I am sending you ab9183 as a free of charge replacement and you should have it by 10.30am tomorrow morning. You r new order number is *****. I was wondering whether these would crossreact with mouse cd59. Thank you. These two monoclonals (ab9182, ab9183) have not been tested for cross reactivity with mouse CD59. Many thanks for this useful information which we will certainly make available via the online datasheet for this product. I note the originator of this antibody advised that it works under conditions of SDS-PAGE, but the sample buffer should not contain reducing agents (DTT, Mercaptoethanol). WB conditions will vary in different people's hands, and I will certainly include your comments and recommendations on the online datasheet. We will foward a replacement vial to you and thank you again for your feedback. Will this ab work in Westerns under denaturing conditions, e.g. with SDS? It works under conditions of SDS-PAGE, but the sample buffer should not contain reducing agents (DTT, Mercaptoethanol). SDS presence in the buffer is fine.